If I had to name my one indispensable Mallorcan product – apart from the wines! – it would have to be the island’s luscious extra virgin olive oil. Olive trees first came to Mallorca more than two thousand years ago and today there are thousands of hectares of land devoted to growing the trees. Many of them are more than a hundred years old, and nature and time have sculpted their trunks into living artworks – shapes that further enhance the already rugged and spectacular beauty of the island’s rural landscape. Visit the Tramuntana mountain range (a UNESCO World Heritage Site) and you’ll see amazing examples of these ancient trees – many grown on stone-sided terraces hewn from the mountainside by hand. In the heart of the mountains is the world-famous village of Deià. Writer and poet Robert Graves lived (and is buried) here, and it continues to be a magnet for artists and creative people seeking inspiration from their surroundings. Many artists and sculptors have been inspired by the twisted gnarled trunks of ancient olive trees. The village is also famous for the 5-star hotel known today as Belmond La Residencia. Numerous notable people have stayed here, and the famous British businessman and founder of Virgin, Richard Branson, used to own it. We’ve had three one-night stays in this hotel in past and it always has a slight feel of a top-quality English country house hotel – but with Mediterranean cuisine and ambience and, of course, much better weather! It’s a member of the Leading Hotels of the World consortium. In its former life the hotel was an estate where olive oil was produced, and the intention is to restore the 14 hectares of mountain olive groves, which are home to more than 1,500 olive trees – some over a thousand years old. Olive production from these groves is increasing year by year as the trees are looked after again. Of course, dedicating time and expertise into restoring the groves costs money. But the hotel – an innovator in many areas – has come up with the idea of offering olive trees for adoption. Anyone wanting to do this will be allocated a tree, and ownership will be marked by means of their name sculpted into an olive wood plaque. The money raised from the scheme will go towards the restoration and care of the trees. And each year those who adopt a tree will receive a bottle of the ‘liquid gold’ extra virgin olive oil produced from the estate’s olives. 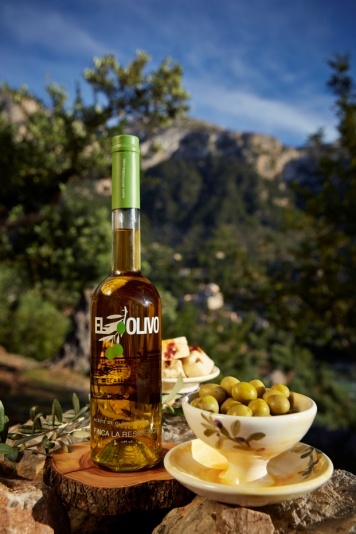 Olive oil at Belmond La Residencia Deia, Mallorca. Photo courtesy of hotel. These venerable trees are a part of the island’s history, as well as its future as a producer of delicious and incredibly healthy olive oil. If you’d like to help Belmond La Residencia’s olive grove restoration project, adopting one of their olive trees will cost you 200 euros, for one year. And coming to see your tree would be a great excuse to stay at this beautiful hotel . . . if one were needed! To adopt your own olive tree in beautiful Deià, Mallorca, or for more information, contact Louise Davis, PR Manager Belmond La Residencia louise.davis@belmond.com.